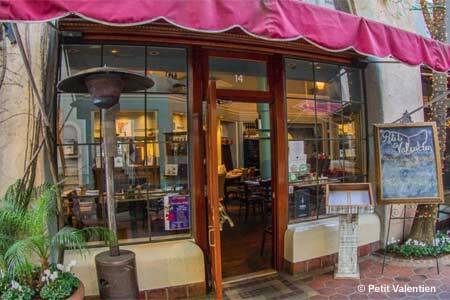 A delightful downtown setting and French cuisine draw an eclectic crowd. : Chef Robert Dixon pays tribute to French neighborhood bistros at this delightful restaurant in La Arcada --- a quaint outdoor shopping area of tile-lined walkways, fountains and art galleries. The menu changes weekly, and Dixon makes use of local, seasonal ingredients wherever possible. He adds a touch of panache to most of his dishes, yet never wanders too far from straightforward cooking techniques. We particularly enjoy the bold, contrasting flavors of his roasted quail with bitter olives and sweet grapes. Other highlights include a refreshing pear and endive salad; artichoke pancake with tomato and red onion confit and warm goat cheese; and filet of sole with lemon, capers and fresh spinach. Desserts, such as lemon-scented cheesecake, chocolate marquis and crème brûlée, are made on the premises. With its prime downtown location and affordable prices, Petit Valentien draws an eclectic crowd of locals, college students and tourists lucky enough to have stumbled upon this gem.